For anyone else who might be searching for new ways of using zucchini, I really, really like this recipe, and my kids have no idea that zucchini is in it–a definite plus. 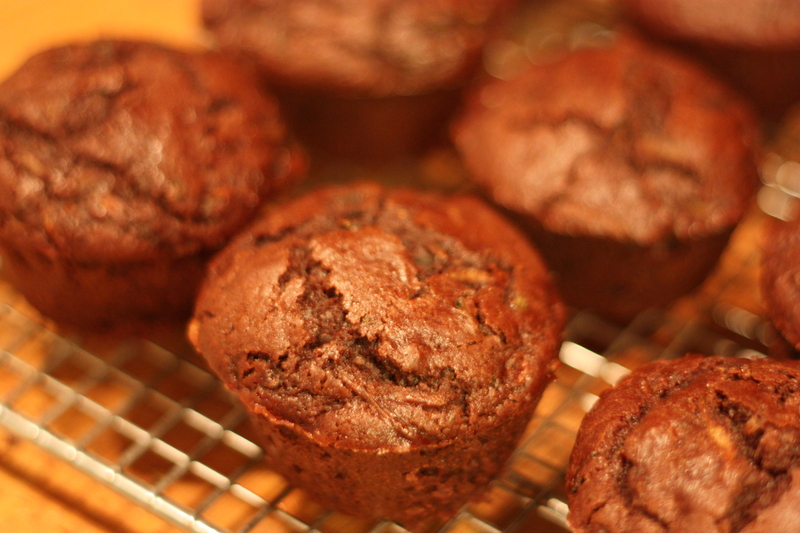 This recipe was originally published in Everyday Food as “Ian’s Sweet Zucchini Cupcakes” (May 2007), but I’ve changed it a bit (added the chocolate and the milk), because of a memory I had of a chocolate zucchini bread that I loved. If you want to go without the chocolate, just omit the milk as well, and you’ll have the original. Note: I used dutched cocoa, but if you only have baking cocoa like Hershey’s, I would love to hear if the recipe would still work as well–I imagine it would. Also, you can leave these cupcakes unfrosted to be more like a muffin, or you can insert the cream cheese frosting into the middle of the cupcake for a really fun surprise, or spread on top, and sprinkle with cinnamon. Also, as far as I can tell, muffins usually have one less egg than cupcakes, and sometimes a little less sugar. I think these could count as muffins as they are, but if you want them to be denser, omit one egg. 1. Preheat oven to 375. Line cups of a standard muffin tin with a paper or foil liners. Set aside. 2. In a medium bowl, mix together flour, brown sugar, baking powder, cinnamon, cocoa, and salt. Mix in nuts. 3. In another bowl, combine zucchini, oil, eggs, milk, and vanilla,; add to flour mixture, and mix just until combined. 4. Divide batter evenly among cups. Bake until a toothpick inserted in the center of a cupcake comes out clean, 30-35 minutes. 5. Cool in tin on a wire rack for 10 minute; turn cupcakes out, right side up, and cool completely. Meanwhile, make Cream Cheese Frosting (if using–see below). Using an offset spatula or butter knife, spread frosting on cupcakes. The frosted cupcakes are best eaten within 1 day. In a medium, with an electric mixer, beat 4 T. room-temperature butter with 4 oz. cream cheese until smooth. Add 2 c. powdered sugar and 1/2 t. vanilla. Beat until light and fluffy. Delicious!! I have to admit I left the milk out–on accident—and they turned out superb-more like a dense cake. I used Hershey’s cocoa powder too and it was delicious as well! The cream cheese frosting was truly the “icing on the cake”!!! !